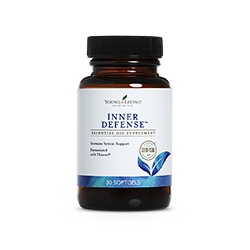 Inner Defense Supplement supports the body's natural defenses and contains the famous Thieves Oil. Supports healthy respiratory and immune systems; and is rich in thymol, carvacrol, and eugenol. Did you know that this product contains the same oils used in the famous Thieves Oil? Yes, it contains Thieves™ Oil Blend which was developed based on the ingredients found in the "Four Thieves Vinegar" or "Marseilles Vinegar". The vinegar was first prepared by thieves who robbed graves in the 15th century. This is an easy reference guide for Inner Defense Supplement. It will tell you how to use it and what to use it for! Want to Purchase Inner Defense Supplement? Then go to the Oil Shop! Buy Inner Defense here! What is in Inner Defense? Cinnamon Bark Essential Oil (Cinnamomum verum) The essential oil promotes a healthy immune response, and helps maintain a healthy lifestyle regimen. Eucalyptus Essential Oil (Eucalyptus radiata) may support a healthy respiratory system; and to soothe muscle discomfort after exercise. Oregano Essential Oil (Origanum vulgare) Oregano, when taken as a dietary supplement, supports a healthy lifestyle regimen. It is a key oil in the Raindrop Technique; and contains the naturally occurring constituent carvacrol. Lemongrass Essential Oil (Cymbopogon flexuosus) Supports overall well-being, and may support the digestive system. This oil includes naturally occurring constituent geranial. Sweet Marjoram Essential Oil (Origanum majorana) relaxes tense muscles after exercise. It is beneficial for occasional simple nervous tension; and is a key oil in the Raindrop Technique! Thyme Essential Oil (Thymus vulgaris CT thymol) as a dietary supplement, it is one of the strongest antioxidants known to man. Thyme supports the immune, respiratory, digestive, nervous, and other body systems. Known since ancient times as a medicinal herb, thyme contains large amounts of thymol. Softgel capsule has been reformulated with fish gelatin to remove the need for carrageenan and bees wax used in the porcine gelatin based softgel. What are the Documented Uses for Inner Defense Supplement? Supports healthy immune system; supports healthy respiratory system. How do I use Inner Defense Supplement? Take one capsule per day or as required. For better results, take in the morning and take any probiotic supplement 8 hours later. Can this oil be used for Animals? Yes. Cats will not like the taste of this and the capsule is too much to feed so will have to open the cap and use a very small amount in a syringe to feed orally. Small dogs usually tolerate one capsule; 1-2 for medium; and 2-3 for large. Split them up. You can feed these to horses..the problem is most won't eat them out of the grain, so it can be tough. Feed in between any probiotic. What are the Safety Precautions? Pregnant women (or animals) should not take this supplement without a physicians consult. Contains fish (tilapia, carp) and tree nuts (coconut). Best taken separate from Probiotic supplement.